Monsoon Watch - 3.. 2016 ....Part 1....2nd May 2016.. Subsequent to writing the MW-2, we are keeping a careful watch on the ENSO developments. El Niño is present and is weakening. During the last four weeks, equatorial SSTs were above average across most of the Pacific,except near S. America.However, Below-average subsurface anomalies are evident across most of the equatorial Pacific. Since mid-April, below-average SSTs are apparent near S. America. But, (SOI) has become negative over the past two weeks, with values returning to neutral bounds. The latest 30-day SOI value to 26 April is - 20 ( Falling from -7.5 in 15 days). The most recent ONI value is 2.0c...(El Nino is characterised by ONI values of 0.5 or above, La Nina is characterised by -0.5 or below). Indicator: +ve...as Neutral Chances of ENSO in Early SWM Months.. The seasonal low in the Thar region is now very weak.The pressure around the Thar desert region is now 1002 mb (994mb required by June beginning). Proper central core is forming now. And ,as per the required scheduled development, a proper gradient should be in the making. Day temperatures have been normal to above normal in the MW-2/MW-3 inter period ! 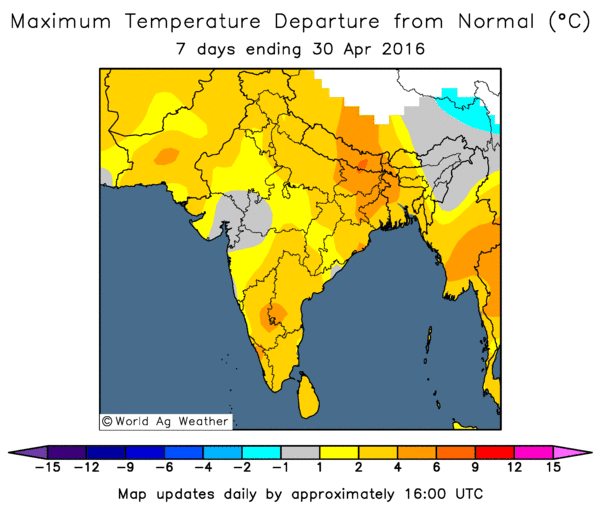 Above normal day temperatures by as much as 6/7c had been recorded in West Bengal, Odisha and Telengana. The Heat now required is in Sindh Region (and Rajasthan). The highest on date in the Sindh areas is 47.5c. In India, it has reached 48.5c, in Odisha. Currently, last 2 days, the Rajasthan region is managing 45/46c. An exception this year is the Vidharbh region. The temperatures in Vidharbha are just about managing 42/45c ( Highest recorded on 1st May), and in some cities just hovering around the low 40s. Normally Vidharbh is a hotbed. 2016: We may feel the heat in the day temperatures, but the minimums are not even near 30c, only on one night Delhi touched 29.5c, but since then its around 22/23c in Delhi. No 30c recorded yet in Sub Continent. The minimum anomaly is seen here. 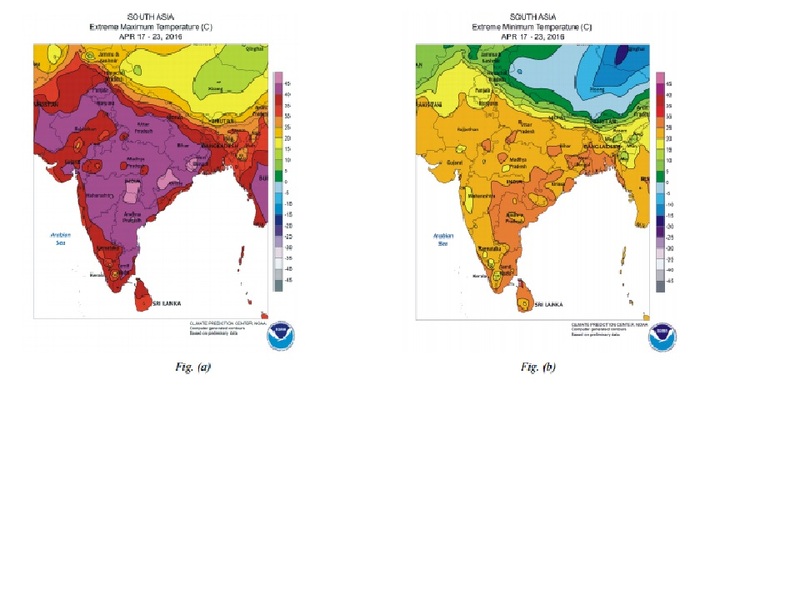 Most of the Sub Continent in the "Normal" range and North in below normal. In south and East we see above normal. The max and min temperatures have to rise now in Sindh, Balochistan and North India. Trends of rising temperatures may be seen again in Vidharbh, Gujarat and adjoining regions of Sindh. In 2015, the minimum temperatures touched 33c in Sibbi on 26th April, 31c in Rohri Pakistan on 30th. In India, a minimum of 30c or above was yet to be achieved. The line of dis-continuity, currently is located, as a weak trough, in the centre of Southern Peninsula, South from East MP thru Vidharbh and interior Karnataka into Telengana. For a proper moisture incursion into the Peninsula, and for an ultimate strong Monsoon, LWD should strengthen, in the centre of the Southern Peninsula region. ( Will strengthen in the next 2 days). Out breaks of pre- monsoon thunder showers are expected normally in the southern states and South Maharashtra. Though the showers in the South are scanty as on today. We need the thunder showers to commence and precipitate in Maharashtra and Interior Karnataka, indicating a proper flow of moisture into the peninsula region. This is seen developing from 1st week of May when we will see moisture from Arabian Sea and Bay converging in the Interior Peninsula. Continuing from MW-2, "Bay of Bengal" low pressure parameter is a worrying factor. 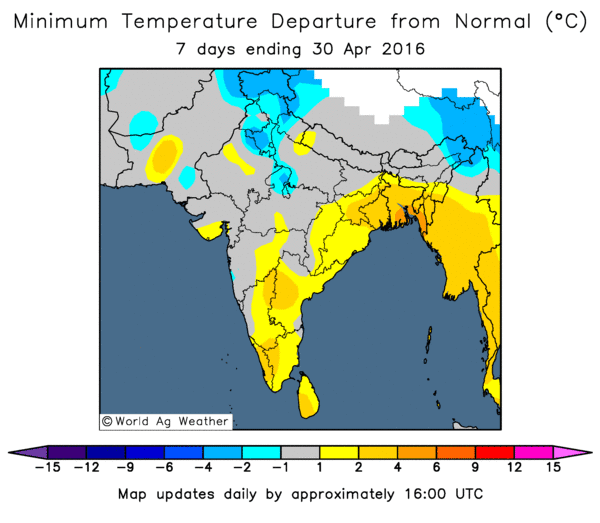 Normally, the Bay should host a pre-Monsoon low any time after 15th.April. 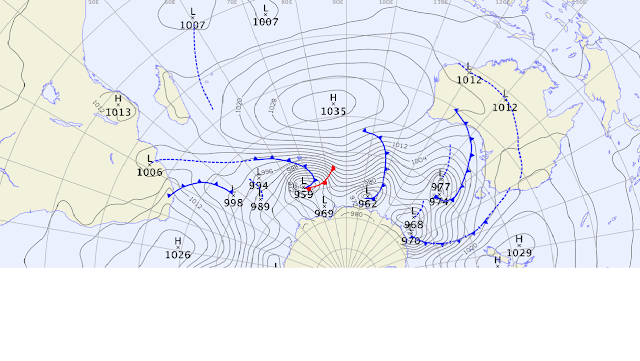 Like I mentioned in the previous MW, in 2011 we had a cyclone in the Bay by the third week, and in 2009 a cyclone crossed the Bay on 12th April.2012 hosted a low around 25th April (BB-1). What is needed now is a pulse from the Far East, to start with, and break up the existing high pressure area. Currently no Storm or Low pressure in the Phillipines Seas. MJO has entered a weak phase in our seas. MJO wave gets slightly positive in Bay around 18th May...seems suitable for the Monsoon there ! MJO may turn Neutral after 8th May in the Arabian Sea sector. The shading indicates outgoing longwave radiation (OLR; W/m²). Only +ve sign of a quick formation is that the SST is conducive. Map shows around 30c in the Bay and 31c near the Andaman Islands. Getting favourable temperature for low formation. The Southern high pressure region, the Power House of our Summer Monsoon,shows the development of a proper High at 1035 mb. Subsidiary Highs will soon form. The Mascrene Highs have maintained their strength, and i would say gained to some extent... at 1035 mb. The winds get organised as soon as the trough in the South Arabian Sea becomes weak. However, The region below the equator in the Bay sector is almost in the same situation as MW-2. In the Bay Branch, the Cross equatorial winds are still haphazard and disorganised. 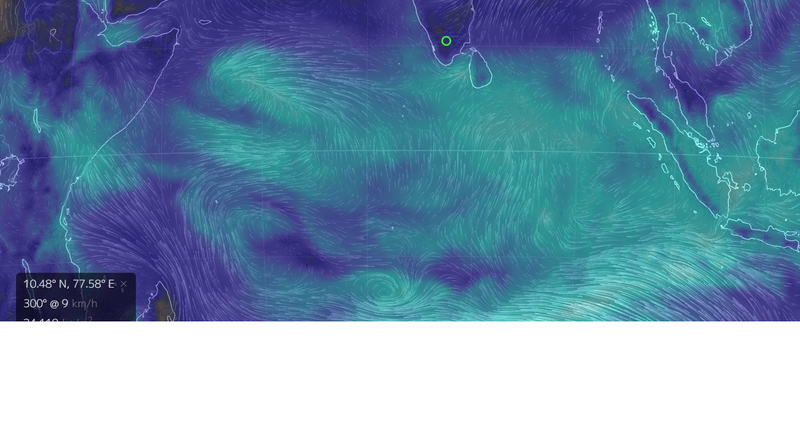 But, in the Bay along India coast, , the winds turn Southerly, due to a weak High Pressure in the Bay. The winds hitting Sumatra coast are not Westerly (as required), and also needs to gather strength soon. ITCZ is now close to the Equator. If no further systems form, we see ITCZ moving North, the High in the Southern Indian Ocean has a fair chance of getting stronger and anchoring well. 5. The 200 Jet Streams too, show some awkward anomaly, in the last week. I would put a slight delay in the South West Monsoon arrival dates for Andaman and Kerala as of now. But would like to wait for another 4 days to see any changes in parameters, so will put up MW-3 Part 2 (Brief write up) on 5th May with proper dates of SWM arrival. 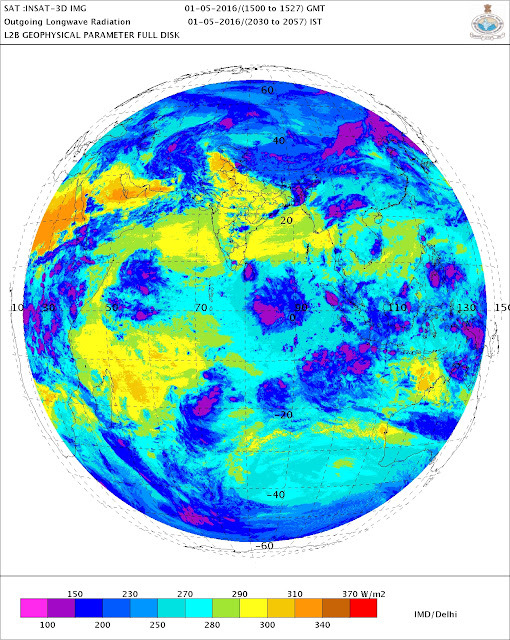 Then, we go into analysing the quantum of rainfall expected, in the subsequent MW-5 (which as usual will be in 2 parts), and will be ready for publication in Mid May. Battling with negative factors over weighing positive ones,let's hope part 2 MW 3 swings the factors positively. ...keeping fingers crossed....Thanks for a lovely write up ...juSt lil curious jet streams factor is numbered 5 but in summary only 4 factors +/- considered. I guess this factor along with other ones would play part later in your MW series. .. Thank you Sir for another good explanation on the current scenario. The MJO forecast from various models show some inconsistency with the likes of POAMA expecting weak amplitude for the first fortnight. How much do you think it is likely to influence the possible evolution of tropical disturbance in North Indian Ocean. http://www.tropicaltidbits.com/analysis/models/gfs/2016050118/gfs_mslp_uv850_ind_53.png Around middle of May we are seeing the trade winds reach some velocity in the Bay Branch but the High Pressure in the Arabian Sea continues to hold strong. What is your take on this Sir? Thanks for the detailed and well illustrated write up. As always, your analysis help in learning as well as informing!
" The 200 Jet Streams too, show some awkward anomaly, in the last week. Ankit: In simple terms, it means the jet stream at 200 hpa has diverted direction a bit in between 19N and 34N , which is the main flow, to flow in from the North East. This has changed as a rough has formed in the East. The maximum core winds are at 128 kts over the Punjab region. Change of direction to finally Easterlies is seen in jet streams in peak Monsoon time. We should expect a gradual change soon. But, (SOI) has become negative over the past two weeks, with values returning to neutral bounds. Sir it has fallen further from -7.5 to -20. Should we watch positively? or is it values returning TO neutral bounds or values returning FROM neutral bounds? Any chances of cyclone in arabian sea before onest of monsoon. srikanth: I have given my views on the likely expectations of the MJO...and that should help the Bay branch 3rd week of May. Generally, the Arabian sea high pressure can remain upto end May, without actually disturbing the Monsoon. The MOnsoon arrives from the Maldives to Sri Lanka by 24th May. Moshin: There is always a chance for a cyclone in Arabian Sea in end June. Sir, do u see chances for karachi during coming WD? 4 to 6th May? Khyati: I have been writing and concentrating on the Mw series. Each MW article takes 3/4 days to compile and write it in proper order. Getting less time on daily weather now.In addition, i need to study and follow every parameter in details, as much as possible. Sir tommorow wheb will you publish MW-3 part (2)? And For madhya maharashtra Rain Forecast Same or any changes for 5,6 and 7 may. Currently experiencing a WD. Will it play 'spoilsport' for seasonal low ? must certainly disturb things there. abizer: MW-3 Part 2 will be published by 10.30 pm IST Thursday 5th. Prasad Godase: Yes, we can expect rains in Maharashtra interior from 5th and on 6th and 7th. Neeraj: Western Disturbance M-1 has already "spoilt" the core of the seasonal Low. Will take 4 days to get back to normal. I am expecting M-2 from 12th, and seems a stronger one. A bit early to say, possibly strong.